The iconic Nokia 3310 is back! 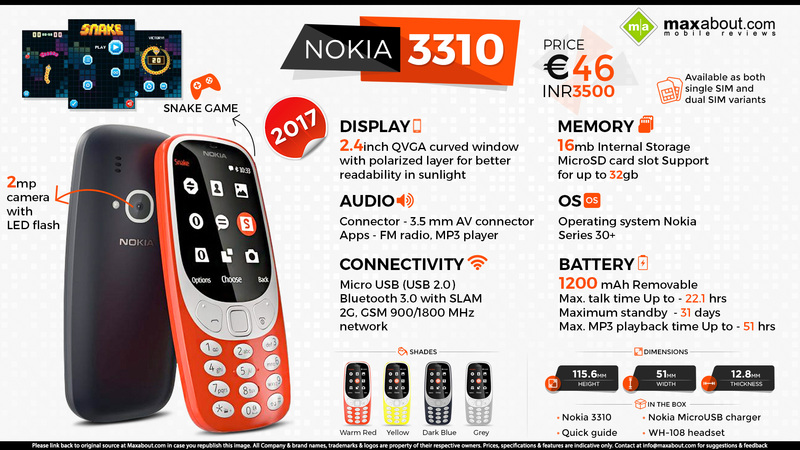 The feature phone has been re-introduced at Mobile World Congress 2017 in Barcelona for 49 Euros (INR 3500). The most popular model of all time, Nokia 3310, now comes with enhanced visual identity and host of added features than its predecessor. The phone’s first generation was launched back in September 2000, selling more than 126 million units at that time. It is undoubtedly a very important product in the company lineup. 2017 model of Nokia 3310 is expected to come to India by June this year. Read More about 2017 Nokia 3310. Downloaded 29 times this week.